Speaking Bipolar really started as a joke. In the years since my diagnosis, I have grown a fairly large circle of bipolar friends. We joke frequently about how interacting with someone with bipolar can be a struggle. One reason is that we often do not say what we really mean. Another reason is that we often hear something completely different than what is said. With that in mind, I said I was going to write a book. In the book, I would work to translate bipolar. For a long time, it never got further than being a joke. Over the years, the idea has come to mean more to me. Now it is something I am actively pursuing. While I hope that I will be able to add humor to this site, the thing that finally pushed me to start this blog is very serious. Suicide has become a terrible pandemic. In the United States, suicide is the tenth leading cause of death. There are on average 123 suicides per day. 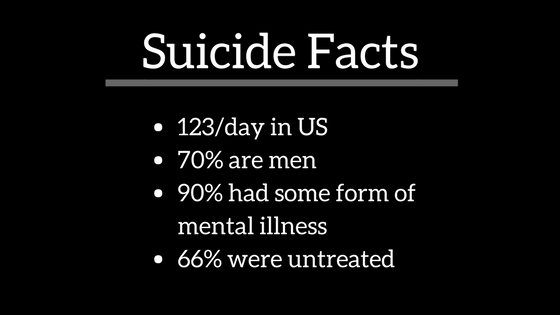 Roughly 70% of these suicides are men. To make matters worse, as much as 90% of those suicides are tied to a mental illness. As many as two-thirds of that number are untreated or undertreated. Depression and suicide in men are called the “silent epidemic.” It is silent because far too many of us, myself included, are afraid to bring this subject out into the light. Male suicide has made headline news with celebrities like Robin Williams and Chris Cornell. Unfortunately, we are not learning the lesson. Personally, I have lost six men in my life to suicide. My goal with this blog is to help get the conversation started. I was diagnosed as bipolar in 1995. The diagnosis followed more than three years of me putting my family, friends, and girlfriends through hell. Finally, I had to be hospitalized for my own protection. I was 23 then. The next several years were almost as rocky. Getting a diagnosis is often only half the battle. Then you have to set out on a largely trial and error plan of treatment. I went through more than 30 medications before finding the correct cocktail that keeps me a productive member of society. Disclaimer: I am not a mental health professional. Through this blog, I hope to share my personal experiences and those of close friends. Every effort will be made to post links to helpful sources and organizations. The good news is that I did find a combination that worked. For almost 20 years now, I have been a stable individual. I thought she was crazy. Thoughts of suicide are part of my history as far back as I can remember. I have very clear memories of discussing suicide with my friends back in the fifth grade. Those friends did not know how to help me, and I was afraid to ask an adult for help. In the years since I have asked many “healthy” individuals about suicide. Almost everyone told me they had never considered suicide. Never. That information was eye opening and life changing. If you are thinking about suicide, something is wrong. Seriously wrong. Tell someone today and get the help you need. If the first person can’t help, tell someone else. In the beginning, I was first diagnosed with depression by a well-meaning general practitioner. She prescribed a medication and when I told her it wasn’t working, she just kept increasing the dosage. The medicine was great in some ways. It kept me in a nearly constant manic state and made it possible for me to work 80 hours a week, serve as a volunteer and have a social life. One can only stay manic so long before the universe and the brain scream for balance. The tipping point is what led to my hospitalization. I will share more about my experience in future posts. The takeaway from my story is that you do not have to feel depressed, crazy or whatever feeling you are feeling. There are treatments that work. Don’t give up, because, with the right treatment, life gets so much better.